As parents you will of course understand that if the kids are enjoying their holiday you can too. 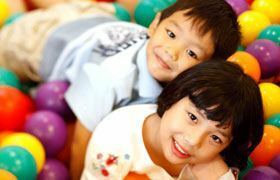 At Centara Hotels & Resorts they take this responsibility seriously and within their kids clubs create an environment which is as informative and mind stimulating as it is fun and exiting for children of all ages at almost all of their many hotels across Thailand. This way you can enjoy a great vacation yourself in the knowledge that the children are enjoying them selves in a safe, professionally managed environment. At the 4 star Centara Karon Resort Phuket kids club where 3 kids pools with water slides adds to the fun while you relax at a swim-up bar, similar facilities at its 4 star sister venue in Kata Beach as well as 5 star places like Centara Grand Beach Resort Phuket and Grand Mirage Pattaya, both of which also feature extensive water parks and extending to their hotels in Krabi, Ha Hin and Khao Lak this hospitality chain create an un-paralled playground between land and sea. Doors open at 09:00 am 7 days per week and closes at 18:00 pm. Entrance for children is free, while there may be a charge for participation in some activities. Baby sitting services are also offered for which a fee is charged and paid at the hotel. Please refer to our below chart detailing available activities. At Camp Safari kids aged 4 through 9 years can participate in as many activities as they wish. Their Camp Safari Card has a number of adventures they must complete in order to receive their sticker and once completed special prizes are awarded. The best news yet is that if you don't have enough time during your stay to complete your adventure you can continue next time at a Camp Safari at any other Centara hotel or resort anywhere in the world. Our E-Zone offers the best and latest in entertainment. It is designed to provide a separate area for teen's aged 10 to 17 so they are not mixed with the young kids. Teens have an area with up to date games for their age group. All E-Zones are equipped with a selection of Video Games Stations such as PlayStation, Nintendo Wii, computer games, etc. The activities which have an * carry a charge. Please check directly with the hotel for further information.